Ahhh, jerk chicken. One of my favorite dishes. It’s spicy, kind of sweet and when made well should almost melt in your mouth. On a cold winters night, there’s nothing that can snap you out of a cold-weather-depression than cooking up something from the Islands. Jerk was used as a way to preserve and cook meat and was originally only made with pork. Interestingly, I found that the work “jerk” comes from a Spanish word called “charqui” which means dried meat. This is how we coined the term “jerky” for that awesome, chewy and salty dried meat we can pick up in 711’s or other corner stores or truck stops. Another possible meaning of the word stems from what happens to the meat when you prepare and cook it – you poke it/or jerk it to produce a hole in order to fill it with the spice mixture (which I didn’t do). I also read that it could come from the reaction your body has as you eat the spicy meat – your body jerks. How about the way you cook it – you ‘jerk’ the meat off the coals. Whatever the derivation all I know is that it’s absolutely delicious! What’s even cooler is that jerk pork’s origins can be traced all the way back to 1655 during the pre-slavery days of West African hunters (the Cormantees) through a group of Jamaican slaves (Maroons) that escaped from the British during the invasion of that year. The Maroons supposedly developed and perfected the jerk as a way to preserve the meat while they lived in the mountains fighting the British troops. Also, we’d like to thank our friend, Pixie, who gave our recipe a whirl and had a taste of the Islands in the UK one night. THANK YOU!! 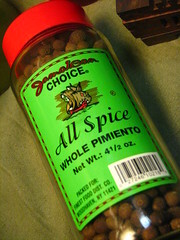 If you are using allspice berries/seeds and whole cinnamon sticks, grind the spices down with a spice grinder. Then blend all the ingredients together in a blender until smooth (or smooth enough – you’ll have a bit of chunks of garlic and hot pepper). I used the olive oil to make it a wet rub. If you feel like you need more or less, adjust so it’s a thick paste. Slab this on your chicken (remember to get under the skin if you can!). Wear some gloves if you have ’em… this marinade contains hot pepper. Allow this to marinate for an hour at least, if you have the time. If you can marinate overnight, even better. Cook your chicken pieces at 400 degrees for 45 minutes to 1 hour, or until juices run clear. For the last minute, put on the broiler and allow some of the skin to crisp up a bit. Don’t let the marinade burn! Saute your onions and garlic over medium heat for a few minutes (keep em a bit crunchy). Add your rice, the garlic powder, scallions and beans. Add the rice and stir all together. Pour enough chicken stock over your rice that it comes up the width of 2 fingers above the level of the uncooked rice (make the peace sign, put your 2 fingers together, turn your 2 fingers clock wise 90 degrees – that’s how you measure – I’M TELLING YOU – IT WORKS EVERY TIME PERFECTLY). Bring to the boil and allow to cook down until it reaches the level of the rice. When the chicken stock has reached the level of the rice, stir ONCE, turn your heat to low and cover. Cook on low for 20 minutes. After 20 minutes your rice will be perfect, give it a stir and enjoy. ****Traditionally, Jamaican rice & pea should be made with coconut milk. Just replace the chicken stock with 1 can of coconut milk plus enough water so that the total amount of liquid follows the “2 finger rule” (see above). Heat your veggie oil – you want enough to almost cover the plantains. Peel plantains and cut into slices, about 1 inch thick. Fry your cut plantains once for about 2-3 minutes. Drain on paper towels. Smash with a mallet and then fry again for another 1 1/2 to 2 minutes. Drain and season with some salt. Hey Amy… again, this looks so good. The plating itself is hot! One note though: tostones, are never cut diagonally, generally speaking. That cut is reserved for the sweet ripe ones. In Cuba and lot of other Latin American countries that eat them, always do the flat round cut. They have special “tostoneras” to help flatten them out. I have one but prefer using my palm against papel cartucho (brown paper bag). But, I guess at the end of the day, the flavor is still the same it would be a matter of artistic preference. Thanks for the shout out and love the step by step pic…More than I did, that’s for sure! DUH. I actually knew that… maybe I cut on a diagonal b/c it looked pretty? But it actually tastes better when they are smashed from a regular slice. YUM. I used to use a skillet to flatten them! Hey, whateva works! Nice looking meal. The chicken sounds nice and tasty. I have not used plantains before though they sound interesting. Love this recipe, amazing list of ingredients. You’ve managed to plate up really well again! I might just have a go at this myself. Fabulous! I bought some Jamaican seasoning not too long ago- but guess that would be a cheater’s way for attempting this dish. Thanks for sharing, can’t wait to try it. Not just saying it, it’s a promise! Amy, here I am! 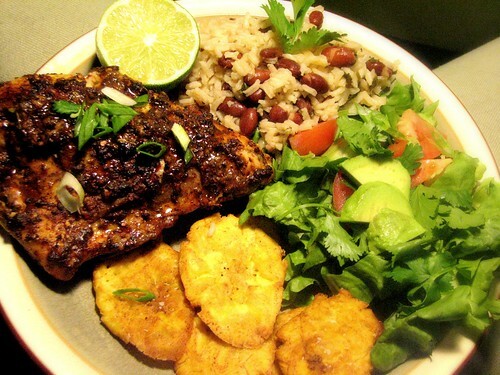 Okay, you enjoy jerk chicken (alot) as i do so, I can tell we’ll get along! I love jerk chicken in the summer. You discovered that I’d used your recipe before I got the chance to tell you! I need to be more organised! Thank you for a great recipe. I’ll be making it again… only with less heat lol. I made this on saturday for my wife as she had to work the weekend and I wanted to make her something beyond the typical. This was alof of fun and easy to maked, admitedly jerk chicken is not to my taste however my wife ate it with abandon and insisted on taking the rest for work on sunday. Sunday I made a second attempt at the hornazo which came out awsome second tiem around. Thanks again. @AJ – the salad there is cilantro, tomato, avocado and romaine, but it could equally be any greens and chopped vegetables of your choice. 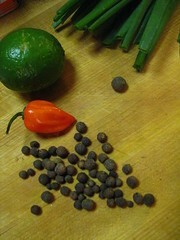 As a dressing, we mixed olive oil with lime juice and a splash of hot sauce, but something less pungent would also work. I’m so excited to make this!!! I am making it for numerous people so I’m tripling everything. My question is the “two finger rule” in the tripling? Make it a six finger rule? Lol:) Thanks for your help! huh? i thought tostones was a hispanic(puerto rican) thing. I didnt know jamacains also ate rice and beans….hmmm i guess we have more in common than i thought. ours isnt spicy though. all our indigenous peppers on our island are all sweet peppers. chicken and rice, chicken and rice, chicken and rice with some tostones on the side…. To “Someguy”: Tostones is actually a DOMINICAN thing originally..you guys call us “Platanos”, remember? Any way, with that being said..all Caribbean countries eat platanos & similar dishes, period — that’s nothing new.. I have only recently discovered the better qualities of Jamaican food. Too many greasy fast food shops had falsely convinced me that was all the cuisine had to offer. Fortunately when my partner went nosing through my cookbooks and wanted to try a goat curry I was enlightened. I found that lots of Caribbean food had similarities to Sri Lankan cuisine, particularly the rice and peas. I grew up eating ‘kiribath’ (literally coconut milk rice) which is similar to Jamaican rice and peas except mung beans are used instead of larger pulses. Funnily enough, like you, I also introduced extra garlic to my version and lots of freshly ground black pepper. I think you guys should try out Sri Lankan food if you get a chance. Just be sure that if you do that on holiday in Sri Lanka its not in one of the annoyingly anglicised hotels. @Ros: Sri Lanka is definitely on the list, but the likelihood of us getting there any time soon is slim, so we’ll definitely be making it before we visit. To your point, much of the Englsih-speaking Caribbean has a profound sub-continental flavor, so it’s no surprise that you noticed some similarities between Sri Lankan and Jamaican foods. ← Ribollita – How Come Peasant Food Tastes SO Good?